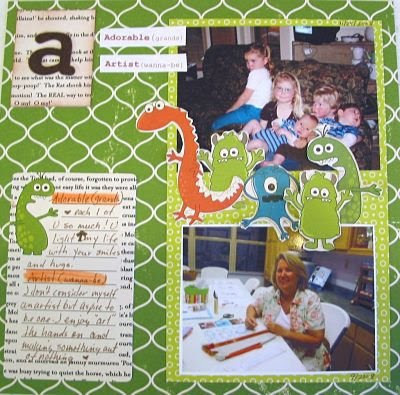 crafty goodies: Encyclopedia of Me / "A"
I really enjoy making these little 8x8 LO pages. Our letter this time was "A". I chose "Adorable grands" and "Artist" wanna-a-be as my "me" words. This is really a fun project. In a couple of weeks I will post the next letter. Hope you decide to make a "me" album. It's not to late to start. Labels: Ency. of me "A"
Congrats on taking on this project...I have it on my list to do, but I'm not inspired by the "ME" topic. Very cute! 8x8 is a fun size.